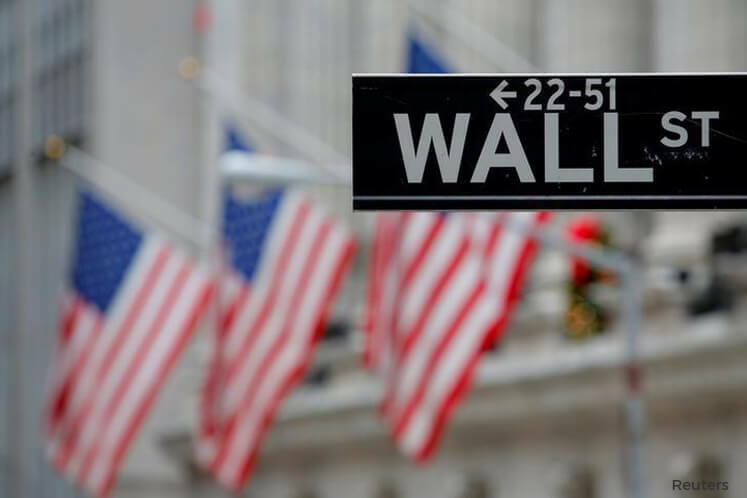 NEW YORK (March 30): US stocks were little changed on Thursday as the upwardly revised fourth-quarter GDP growth rate underscored strength in the domestic economy, while investors looked ahead to the start of first-quarter earnings season. Gross domestic product increased 2.1 percent, compared with the previously reported 1.9 percent, the Commerce Department said. The economy grew 3.5 percent in the third quarter. The market has been choppy in the past few days as investors look for new catalysts and assess the impact of Republicans' failure to pass a healthcare Bill on tax reform and the rest of President Donald Trump's pro-growth agenda, hopes for which have helped drive stocks to record highs. But the rally may be near its peak, according to a Reuters poll of strategists, who forecast US shares will gain less than 3 percent between now and year-end. The S&P has risen 10.3 percent since the US election through Wednesday's close. The rapid climb in equities has raised concerns regarding valuations, with the S&P 500 trading at nearly 18 times earnings estimates for the next 12 months against its long-term average of 15 times. The market will be looking at quarterly earnings to see if the lofty valuations can be supported. First-quarter earnings for S&P 500 companies are expected to rise 10.1 percent, according to Thomson Reuters I/B/E/S. "The market is looking for new catalysts in the form of fresh policy news from the Trump administration that can help regain the confidence in his pro-growth mandate after the healthcare bill disappointment," said Andre Bakhos, managing director at Janlyn Capital LLC in Bernardsville, New Jersey. "Investors are also looking ahead to earnings to see if companies can deliver what the market has already priced in with the current valuations." At 9.33am ET (1333 GMT) the Dow Jones Industrial Average was up 1.17 points, or 0.01 percent, at 20,660.49. The S&P 500 was down 0.65 points, or 0.02 percent, at 2,360.48. The Nasdaq Composite was up 2.11 points, or 0.04 percent, at 5,899.66. Seven of the 11 major S&P sectors were higher, with the energy index's 0.51 percent rise leading the advancers. Economic data showed that the number of Americans filing for unemployment benefits fell less than expected last week, with initial claims slipping 3,000 to 258,000 for the week ended March 25. Cleveland Fed President Loretta Mester, Dallas Fed chief Robert Kaplan, San Francisco Fed head John Williams and New York Fed President William Dudley are all scheduled to make appearances. Shares of Lululemon Athletica plunged 21.3 percent to US$52.16 after the Canadian yoga and leisure apparel retailer said first-quarter comparable sales were expected to fall. ConocoPhillips rose 6.3 percent to US$48.94 after the company said it agreed to sell oil sands and western Canadian natural gas assets to Cenovus Energy. Cenovus was down 10.1 percent at US$11.76. Advancing issues outnumbered decliners on the NYSE by 1,271 to 1,164. On the Nasdaq, 1,119 issues rose and 960 fell. The S&P 500 index showed four new 52-week highs and no new lows, while the Nasdaq recorded 30 new highs and seven new lows.